Whether you're a businessman with one or two laptops open, a technical individual with multiple tabs, or a teenager glued to your smartphone, mostly we go out of power, when we need it the most. Thankfully, this F-EYE ultra high capacity 50000 mAh laptop power bank assures to keep your devices powered during all those crucial moments. 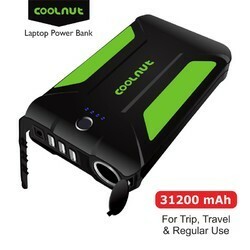 This real massive capacity battery charger is the perfect example of complete dedication and advanced technology innovation of a vendor that went the extra mile to make sure that its product matches the requirements of every gadget_freak. 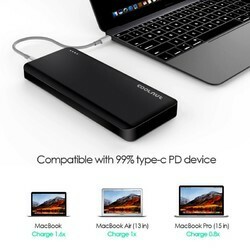 This laptop power bank has in total 6 output ports. There are two output charging ports for laptop: one is 12V/3Amp; the other is 20V/2.5Amp. So, make sure to check the correct & suitable output port, according to your laptop specifications before charging. After you make the power bank connected with your laptop, you need to press the button to turn it on, but no need to press when charging smartphones. The other four USB output charging ports; all rated at 5V/2.4 charges several devices, including all latest smartphones, iPad, tablet and other USB enabled devices. With this ultimate charger, now you can easily charge all your devices. 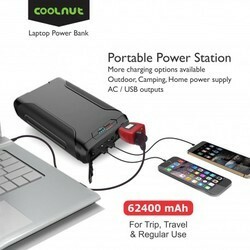 Backed by a one-year manufacturer warranty, this emergency battery charger for your laptop comes with 10 connectors to cover most of the notebooks on the market. It includes 28 laptop connectors, 1 DC cable, 1 AC 100-240V adapter, 1 soft pouch for its safety and a user manual.